While all Americans are taxed in their worldwide income regardless where they reside, they also have Foreign Earned Income Exclusion to reduce the tax burden. And this is what our today’s tax infographic is about. In 2018 you can eliminate up to $104,100 of foreign earned income on your U.S. expat tax return. Let’s look into details and what this exclusion is about. You need to be a bona fide resident of a foreign country or countries for an uninterrupted period that includes an entire tax year. Questions of bona fide residence are determined according to each individual case, taking into account factors such as your intention, the purpose of your trip, and the nature and length of your stay abroad. The foreign country will need to consider you as one of its residents for tax purposes. Having some sort of long-term immigration status, speaking the local language, having a local driving license all help to demonstrate bona fide residence. You need to be physically present in a foreign country for 330 days during a period of 12 consecutive months. 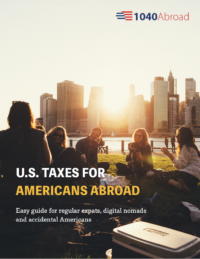 IRS Publication 54, “Tax Guide for U.S. citizens and resident alien living abroad” describes the requirements for the Foreign Earned Income and Housing Exclusions. Click here to view the complete publication. Foreign Earned Income Exclusion for U.S. expats abroad… Is it a good choice? Firstly, don’t rush to select this exclusion on your return! Most people believe that chopping over $100,000 of their income would be beneficial, but it’s not always the case. Depending on your residence country, it might be better for you to claim Foreign Tax Credit. For example, if you are an American living in Canada. This is the same scenario used on their Canadian tax returns for income earned outside of Canada and operates similarly. Basically, the US government will grant a credit for Canadian taxes paid on Canadian income to the extent that the US government taxes the same source of income. Oh, and Canadian tax rates exceed US tax rates for the purposes of the Foreign Tax Credit. So a US citizen always will pay nothing on their US tax return. Do you still have questions? Book a free 20-minute phone consultation call with our U.S. international tax expert.